Harare City Hornets left the country yesterday for Swaziland for the annual Swazi Invitational tournament in Mbabane, with their captain Dancan Shenje declaring the team was ready to strike gold. The national champions' skipper believes the club is ready this time to better their last year's performance, where they finished as the runners-up in the tournament. Powerhouse Jozi Nuggets won the tourney. "We are ready to atone for our defeat (of) last year. "We are better prepared this time around than we were last year. "We are gunning for gold, although I have to acknowledge that the tournament will feature very good sides from the region. "I believe this time around we have to turn the tables and try and win the tournament," said Shenje. Manager Talent Marembe said the tournament will present the club with the right platform to fully prepare for the Africa Club Championships in Botswana in September. "Not taking anything away from the local clubs whom we have faced during the just-ended season, I believe this tournament will be the right platform to fully prepare ourselves for the African Club Championship coming in September. "We are happy to meet some of the best teams from Mozambique, whom we believe will give us something in terms of competition," he said. Hornets lead a quartet of men's clubs and as many female teams from the country at this year's edition of the prestigious regional competition. The council-run club will be joined by JBC, Hustlers and Foxes in the men's pool while Green Stars, Lakers, Vixens as well as Raiders will represent the girl child in the tournament that has attracted teams from Tanzania, Mozambique, South Africa and Botswana. National champions Harare City Hornets are confident they will grab gold at the 2017th edition of the Swaziland International Invitational tournament from June 23-25 in Mbabane. The council-run club settled for silver after playing second fiddle to Jozi Nuggets of South Africa in the championship last year. But the reigning Harare Basketball A League kings believe they have now come of age. Hornets secretary-general Forster Manezho said his team was raring to go. "We believe this is our year and we have already conquered all before us in the local scene. 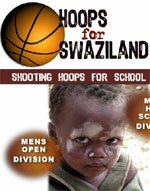 We are quite convinced we will win the Swaziland invitational tournament," he said. "We narrowly lost in the final last year but we are more prepared for this year's edition of the championship. "Every member of our club is keen to play their part and we are confident we will deliver the trophy home. "This is a tournament that we want to win at all costs. We have won every tournament that we were involved in this year and it will only be right we wrap up the season with a podium finish in Swaziland. "We know it is not going to be easy but, for a team to be competitive, they have to win tournaments of this magnitude." Four men's teams and as many women's clubs from Zimbabwe will be part of the jamboree this year. Harare A league runners-up JBC, Hustlers and Foxes will all join Hornets in the men's grouping at the tournament while women's national champions Lakers, Vixens, Raiders and Green Stars will represent the country in the female category. The region's most prestigious invitational tournament has attracted clubs from Malawi, South Africa, Botswana, Tanzania, Zambia and Zimbabwe. THE Swaziland National Basketball Association (SNBA) have since postponed the start of their league games initially scheduled for next weekend. The games have since been shifted to a later date which will, however, be announced in due course. This was confirmed by the associations President Clement Dlamini, who explained that they had been forced to postpone the league due to some various logistics which they were still working on with the management committee. We would like to apologise to all the teams and relevant stakeholders for the postponement of the league games due to some technicalities which we are still going to discuss at executive committee level. We also have venue shortages as the Mavuso sports centre has been closed hence so we felt we should postpone the games. We will notify the teams after the annual general meeting on the new date, he said. The basketball league is sponsored by Dups Insurance Brokers to the tune of E120 000 and was launched two weeks ago, where last seasons presentation and awards were held at the Sibane hotel.